“Golden rice” is a genetically modified rice product with murky beginnings. Calgene (the company that created Flavr-Savr tomatoes genetically modified with fish genes) held the first patent. It, and its inventor, Christine K. Shewmaker, apparently transferred to Monsanto when the company bought Calgene. Later on, the patent turned up at Syngenta under the names of two genetic engineers out of Switzerland and Germany, one of whom helped to do plant modification experiments that led to Roundup Ready crops. 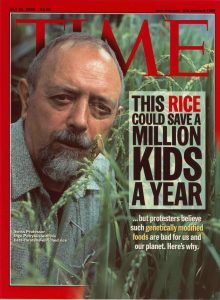 The product has since been the basis of a massive campaign to promote it as a humanitarian venture of the Rockefeller Foundation-backed International Rice Research Institute—the organization that launched the “Green Revolution” in the 1960s. Syngenta and the Gates Foundation are both behind it. But how “humanitarian” is this venture, if its claims are false? Golden rice is a GE version of white rice. White rice is a refined food product. It contains no nutrients beyond starch and has to be “fortified” with a vitamin premix. Unrefined rice is brown, black, or red from natural beta-carotene, B vitamins, vitamin E, fatty acids, and minerals that occur naturally in rice. When commercial processors strip the bran off the rice, they remove all these nutrients. Commercial interests sell off the bran separately, leaving a “dead” product that can sit on a shelf indefinitely. Golden rice is genetically mutated to synthesize beta-carotene in the endosperm where starch is normally stored. Originally, golden rice had three extra genes—a daffodil gene, a gene from a bacterium that causes diseases in plants, and a plant virus. The new, improved version has six, including an antibiotic resistance gene. The new version is designed to make more beta-carotene. Golden rice is essentially a very expensive way of putting a single vitamin—beta-carotene—inside a white rice product. Does It Offer the Cure for Blindness? A massive campaign to sell golden rice to Southeast Asian and African markets has been ongoing for years. It’s based on the claim that golden rice will save children from going blind from vitamin A deficiency. Vitamin A deficiency is widespread in these countries, and it causes other debilitating diseases in addition to blindness. Golden rice is the solution, according to its promoters. 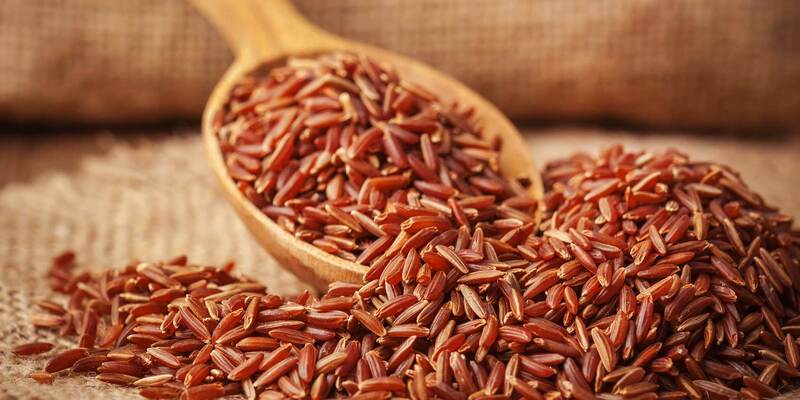 Rice isn’t a primary source of vitamin A in the human diet. Yams, mangoes, greens, and other fruits and vegetables that humans eat contain much higher levels. Genetically engineering rice as a source of vitamin A makes as much sense as genetically engineering oysters as a source of fiber. GE golden rice doesn’t contain the fatty acids necessary to absorb beta-carotene. Golden rice itself doesn’t provide any beta-carotene at all. Only when fat is added does it provide a source of vitamin A. This is problematic in poor countries, and the extra cost of adding a fat has to be figured in. The perfect golden rice already exists. Natural, unrefined, rice contains multiple carotenoids in addition to beta-carotene, along with the fatty acids necessary to absorb them, vitamin E, B-vitamins and minerals—all in one neat little package. The solution to vitamin A deficiency in poor countries is not expensive and complicated; it is simple and cheap. According to the World Health Organization (WHO), the primary cause of vitamin A deficiency is intestinal parasites. Cheap, and readily available drug treatments for parasites, along with a nickel’s worth of vitamin A supplement, can significantly reduce mortality related to vitamin A deficiency in Southeast Asia and Africa. Organic farming and halting the destruction of natural resources can reverse not only vitamin A deficiency, but vastly improve all aspects of nutrition. In stark contrast to golden rice, the World Food Prize just went to developers something that will actually provide better levels of vitamin A—an orange sweet potato for cultivation in Africa. This potato could reduce children’s death rate by 25%—proof that vitamins matter tremendously for human health. Best of all—it’s not GMO! Golden rice didn’t undergo animal testing before it was fed to humans. In 2009, a brouhaha erupted when it was discovered that trials had been done in China on children. Twenty-two scientists from all over the world signed a letter of protest to Tufts University, which set up the trials. Among other things, the scientists invoked the Nuremberg Code, which prohibits medical experimentation without informed consent. In response, investigations were initiated by Tufts, the US Centers for Disease Control (CDC) and its Chinese equivalent, and the Chinese Ministry of Health. According to reports, officials at the Chinese CDC were punished and parents of the children were paid damages by the Chinese government. The first clinical trial of golden rice was set up in 2004. To date, the product has not been accepted by governments or by the public. It will contaminate natural rice, with unknown results. It destroys biodiversity. Genes for golden rice are in a hybrid promoted all over the world. Planting golden rice is planting monoculture. It destroys food sovereignty. Golden rice is part of a global program that makes farmers and consumers dependent on multinational corporations. It’s part of globalization, a phenomenon that doesn’t permit local autonomy. It’s still full of “surprises,” even for the inventors themselves. In the latest patent on golden rice, the “unexpected phenomenon termed ‘overshoot’” is discussed. It boils down to this: the plant is engineered to synthesize lycopene, but it synthesizes other carotenoids. The inventors admit they don’t know what causes it. The impact on the environment and wildlife is still unknown. Foreign genes put into golden rice force it to make more beta-carotene than usual. This comes at the expense of other nutrients. The geranylgeranyl pathway that leads to the synthesis of beta-carotene also leads to the synthesis of other carotenoids and ubiquinone (co-enzyme Q10). Diverting the pathway to beta-carotene diverts synthesis away from other pathways. It has been proven that GM (mutant) DNA can be transmitted to bacteria. Bacterial genes can be transmitted to animals, including humans. The ability of golden rice to transfer DNA to bacteria and other living things has not been independently investigated. Nor have the product’s long-term effects on insects and wildlife. Vitamin A plays a major role in embryonic development—minor alterations in this vitamin during development can result in major developmental defects. The consequences of disrupting DNA—our ancient code that’s been in place for hundreds of millions of years—and supports every life form—is unknown.